He chartered and most famously gave up his seat to The Big Bopper (J.P. Richardson) on the plane that took the lives of The Big Bopper, Buddy Holly and Ritchie Valens on “The Day The Music Died” in February of 1959. He was also one of the lead purveyors of the 1970s Outlaw Movement in country music, crossing country music into the world of rock ‘n’ roll. His album Wanted! The Outlaws, that he recorded with Willie Nelson, Tompall Glaser and Jessi Colter, went on to become the first platinum country album, and he recorded as one fourth of the country super group, The Highwaymen along with Johnny Cash, Kris Kristofferson and Willie Nelson. 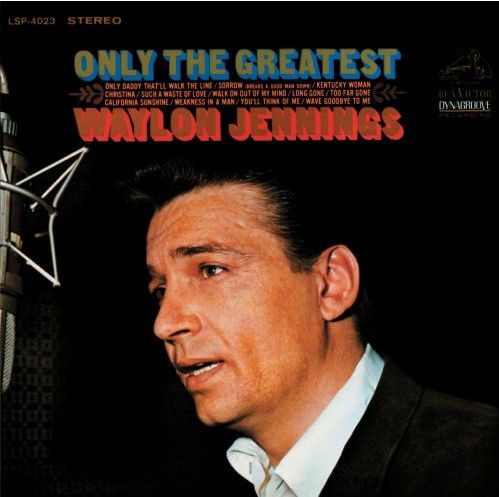 Waylon Jennings’ over-thirty year list of hits includes such classics as “Stop The World (And Let Me Off), “(That’s What You Get) For Loving Me,” “Brown Eyed Handsome Man,” “The Taker,” “Good Hearted Woman,” “Sweet Dream Woman,” “This Time,” “I’m a Ramblin’ Man,” “Rainy Day woman,” “We Had It All,” “Are You Sure Hank Done It This Way,” “Are You Ready For The Country,” “Luckenbach, Texas (Back To The Basics Of Love),” “The Wurlitzer Prize (I Don’t Want To Get Over You),” “I’ve Always Been Crazy,” “Amanda,” “Come With Me,” “I Ain’t Living Long Like This,” “Theme From The Dukes Of Hazzard (Good Ol’ Boys),” “Lucille,” “Will The Wolf Survive,” and dozens of others. Today’s jukebox classic was written by “The Fastest Guitar In The Country,” Jimmy Bryant, who was a well-known session guitarist. (He also played the fiddle on The Monkees’ “Sweet Young Thing” from their debut album.) 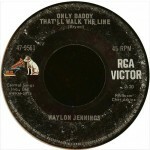 The song was released as a single in 1968 from Jennings’ Only The Greatest album which also included his #5 hit “Walk On Out Of My Mind” and Jennings’ cover of Neil Diamond’s “Kentucky Woman.” During the recording of the album, Jennings was at odds with producer Chet Atkins and the brass at RCA Victor Records over their penchant of using studio musicians instead of his touring band. As a result, the record features members of Jennings’ band and a host of studio greats including Wayne Moss, Fred Carter, Pete Wade, Ray Edenton and Chip Young on guitars, Roy Huskey, Norman Putman and Bobby Dyson on bass, Pete Drake on pedal steel, Buddy Harman, Jerry Carrigan and Richie Albright on drums, Hargus “Pig” Robbins, David Briggs and Larry Butler on piano, Charlie McCoy on trumpet and organ and Harold Ragsdale on vibes. 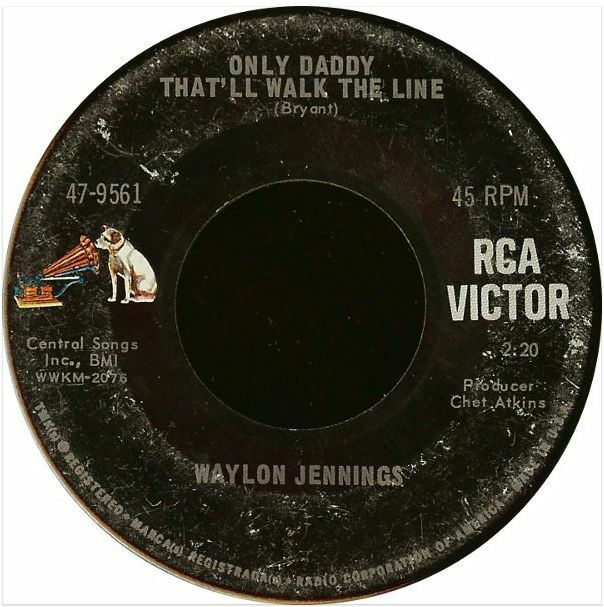 The track peaked at #2 on the Country charts for five weeks in September of 1968 and features Jennings’ plainspoken straightforward delivery atop a chugging honky-tonk guitar intro, and some down-home front porch harmonica playing. It has been covered by the likes of Linda Ronstadt (who changed the gender of the song) and toured with it as part of her repertoire for years, and The Kentucky Headhunters who brought the song back to the country charts (#60) in 1991. The flip of the single, “Right Before My Eyes” was written by Don Bowman and Jackson King and was featured on Jennings’ previous album from 1968 called Hangin’ On. Bowman is also known as the recording artist who brought the song “Chit Atkins, Make Me A Star” to the country charts in 1964. In 2001, Jennings was inducted into The Country Music Hall Of Fame, He died from complications of diabetes in February of 2002.